See below for our screenshot gallery. So who is game for fixing a giant toilet? REDWOOD CITY, CA. - November 11, 2008 - Hudson Entertainment, the North American publishing arm of HUDSON SOFT, today announced that they will bring Pit Crew Panic!, an all-new "panic-action" game, to WiiWare. 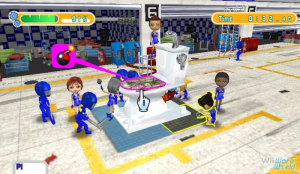 This unique game is full of frantic fixing as the player's pit crew repairs a variety of bizarre "WHATSITS" as fast as they can. "Pit Crew Panic is crazy enough when playing alone," said Sabine Duvall, Vice President of Product Development at Hudson Entertainment. "But when you play this game with friends, either offline or online, it goes beyond crazy. Endeavoring mechanics will find that it's a ton of fun when there are four people waving Wii Remotes around to fix parts on a giant broken toilet!" Players can race against the clock on their own or can play with friends to see whose team can fix the majority of that giant wedding cake! Inspired grease monkeys can even play online and see whose girls can out-fix the opponents on an aircraft carrier, a bridge, a backhoe and many more crazy "WHATSITS"! If a pit crew is up for the challenge, they can team up for 2 vs. 2 or 3 vs. 1 action to see which team can fix the most broken parts on each object. To help the crew fix each object more quickly, players can use the Wii Remote just like a screwdriver, wrench, or other pit crew tools. There is also a handy tutorial to help players figure out not just how to play the game, but also how to go as fast as they can when fixing all the wacky "WHATSITS" in the game! Pit Crew Panic! is rated E for Everyone by the Entertainment Software Rating Board (ESRB). First comment? Nice. Anyways, this game looks pretty fun. Fixing wacky stuff? Not exactly a theme I would want to play even if it was good. Interesting game. I wonder how good this game actualy is can not wait for the review to find out. Chances are though I still will not get it because it is simply to wierd for me. Don't let me down Hudson! It looks pretty terrible, but then again, Hudson might make it good. I think this could be the next "Awesome Quirky Japanese Title". Quirky that is for sure. This game just oozes quirkyness. With those characterts they should have used Miis. Tbh, I don't even think Hudson could make this game great. Maybe good, but not great. im going to skip this one!